There is no good review of various popular social media planners or media management services on the Internet. I hope this proves helpful for you, fellow web searcher. Across December 2016 and January 2017 I signed up for just about every service I could find in this space of social media calendars, planners, managers, schedulers, and automators. Some required payment, some required a credit card and an onerous cancelation policy after a trial period, and some were card-free free trials. But they all require some form of payment eventually for more than just one or two profiles. Post to various social media services. Facebook, Twitter, LinkedIn, and Pinterest were almost always available. Others, like Instagram, were not. The ability to schedule posts on your schedule. The ability to schedule posts on an “optimal time” schedule. 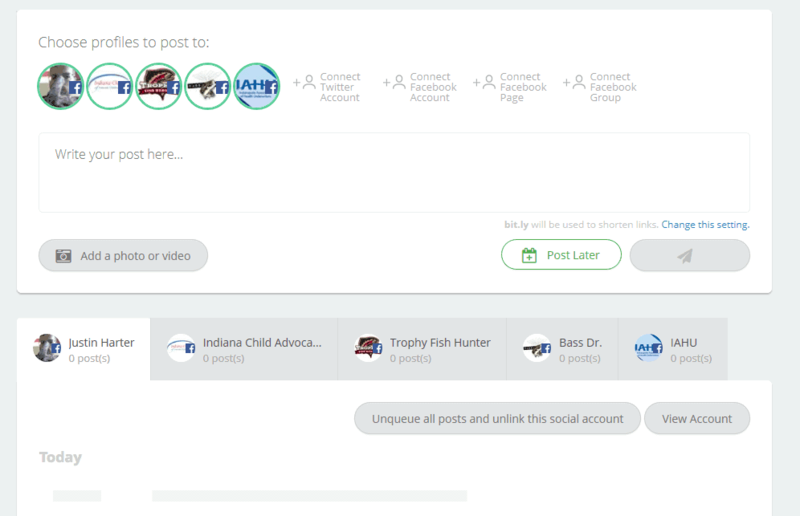 The ability to add more users (a team) to your account. “Content discovery” through things like hashtags, “social authority” and other “these people have big networks and you should try to kiss up to them” features. None of them offer all of those in one service. These social media services do one thing the actual social networks must hate: they keep you off their native site. Which is half the benefit to a lot of people. In my case, I have dozens of clients each with a Facebook and Twitter page. I have one client with 12 Facebook pages. My “Pages I Manage” list in Facebook is about 35 Page Profiles long. Facebook is slow, buggy, and I generally don’t like going there. If I can avoid it, there’s a benefit. But rumor is the algorithms behind Facebook shrink the reach of your post if you make it through a third-party service. Something Post Planner mentions to you after you sign up. The research distills to this: If you have 100 followers and you post something to your Facebook Page via Facebook, 16 people are going to see it. If they don’t like it, it’s dead. If they do like it or “engage” with it, Facebook shares it to more people. If you post that same thing to Facebook via a media scheduler, Facebook may share it to 8 (totally made up number) people, which makes it more difficult to grow your post. The ironic counter to this is all measurements that have been made come after a person starts using a lot of the “content discovery” features of these services. Meaning you used to post things with a little bit of care and effort. Now you don’t because you have a firehose of everything related to craft beer or bicycles or whatever spraying across your stream. Thus, no one wants to see that, so engagement goes down. I think I believe that. I haven’t noticed a drop in “engagement”, because I’ve done what I’ve always done: posted something when someone had something worth sharing. It’s made me less appreciate of the “content discovery” features in services like Hootsuite, Jarvis, and Agora Pulse. It just doesn’t help much. Plus, if you really need that, Google Alerts work about the same way in a much timelier way. Jarvis App’s social media post panel. I’m not sure how this scales up. I will say that Post Planner took this a step further and has “quotes” and “inspiration” feeds. So if you’re a dentist and want to share obtuse quotes or your audience is 50-something Midwestern women who like frilly inspiration tidbits from Winnie The Pooh or Minions, they’ve got you covered. Let me post to multiple networks at once with the same general message. Let me preview the post exactly how it will look to end users before it’s published. Help me schedule the post for the optimal time. Measure some data about how much traffic something gets. Let me continue using bit.ly as my link shortening service. The prices on these services are always changing, so I’m not going to repeat them here. But be wary: they’re expensive. I suppose if you’re one person managing just a single company’s accounts, it may be fine. But I’m managing dozens of people with multiple accounts each. They will all charge you “by the profile”. So if they promise you “2 profiles for $9.99”, that’s two services, not two people. Connect Facebook and Twitter and you’re at your limit. It adds up real fast, especially with so many clients of ours wanting to be on every network everywhere. Agora Pulse had an okay interface, useful features, but was pricey and didn’t let me preview a post before it would go live. You know how when you share a link on Facebook and it pulls a preview image and text snippet? I want to make sure that photo and snippet and headline all look good. Jarvis was looking good to me given it’s $39.95 price for 20 Facebook and Twitter accounts. It included “content discovery”, but it wasn’t very interesting stuff. My problem here is again the lack of a true and honest preview of my post and its organization. It pushes items into tabs and each one has a queue. It takes a very short-term view of a post. It also frequently defaults to wanting to post to all profiles at once. Which is terrifying. It does support bit.ly linking, though. Jarvis doesn’t have a cancellation mechanism online, by the way. You have to email support for them to process that. I expected a full sales pitch, but they were quick and quiet about it. I appreciated that. I could see how their service would appeal to a lot of people’s workflow. I just have too many profiles to manage. CoSchedule gave me the ability to preview a post exactly as it will appear and edit it in real time. It’s a slick and easy interface that I really like. CoSchedule displays all of your posts in a 30-day calendar view. You click on the day you want something to post and it makes it happen. It’ll even suggest optimal times based on some fancy algorithms. In my experience it worked really well. You can, for example, post a link to Facebook and Twitter and it’ll automatically schedule Facebook for, say, 1:24 p.m. and Twitter for 6:47 p.m.. It also supports bit.ly. It’s expensive, though. For me I’d be looking at $125 a month just to keep all the profiles I need some of the time in there. You can buy them in 15-profile chunks for extra, which is helpful, and makes me assume they have some costs involved there. Hootsuite and Buffer felt like one and the same to me. They both let me schedule stuff, but they’re trying to be locked down services. Hootsuite, for instance, requires you to use their notoriously bad ow.ly service. Buffer lets me use bit.ly, but it won’t let me do a blanket system change. I have to set each profile’s settings independently one at a time. It’s an onerous and time consuming process. Post Planner has clearly been reading up on the “Sales funnel process” because from the moment you’re on their site you feel like you’re falling down the funnel. People email and site-chat with you constantly. They also don’t have an easy cancellation process, instead opting to push you into a further sales conversation about why you didn’t decide to stay. But their service is polished and quick. You must login to Facebook to login at all, though. But despite this integration it still didn’t show me any kind of preview of what my post will look like on the other side. They’re big on “recycling content”, too. Their setup is designed to figure out what your most popular material is and then keep re-sharing it every so often. That’s fine for a lot of big operations, but my clients don’t exactly have that. That’s not to say they’re boring or unimportant. Just that they’re businesses providing another service like plumbing. They’re not going to have the most comprehensive plumbing blog on the Internet. I kept coming back to CoSchedule because it was the only one I felt I could actually trust. I’d see what I was typing it, it’d show me how’d it look on the other side, and it did its job easily. But it’s very expensive for my needs. If you had much fewer profiles you might enjoy it even more as the price may fit better. They cross off just about every item on my list: bit.ly integration, post previews, automated or manual timing and scheduling, team organization (if that’s your thing), analytics, “content recycling” they call “Re-Queue”, and easy-to-see and use navigation. In fact, there’s only four possible pages. Everything functions around the calendar view. 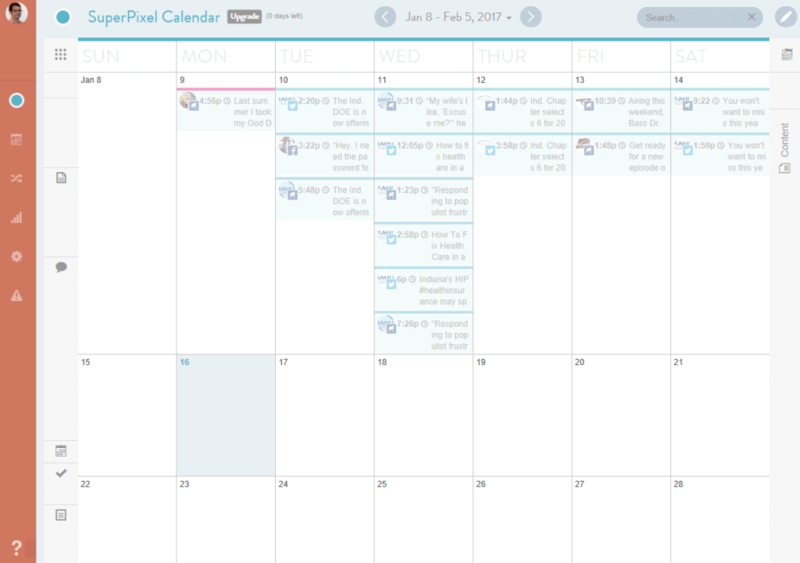 CoSchedule’s default and almost exclusive interface view. I haven’t been able to dig into the social media analytics yet. Through my trial period it kept saying it was still gathering data. I’m not sure any of my posts will ever have the kind of atmospheric rise they think it should have. Most posts get a handful of likes and go on their way. I just wish their price was a bit more competitive. Buffer is close and would be a good choice if you didn’t care about bit.ly integration or had as many profiles. With fewer profiles, Buffer could show profiles more neatly and costs hundreds less over a year or two. Tl;dr: Tried a bunch of different social media planning services. I liked CoSchedule the best, despite it’s higher cost. It had more features I cared about, easier navigation, and felt more like a true web app and not a bunch of profiles tabbed out of Facebook and into some other site. To try CoSchedule, you should use my referral code and I can save a little money. No success on Giving Tuesday? Here are some things to consider. Thanks for this article! I’m still trying to find an affordable solution. Coschedule was my go-to but they just raised their prices. I was paying $108 a year for 5 team members and 4 profiles, now it will cost $726 a year, even with a discount. I wish I could find something at the $108 price point that I liked :/ I will try Buffer maybe. Thanks for this article. Really helpful.